Portrait, Leopold Meyer. Courtesy of Texas Children's Hospital. Image available on the Internet and included in accordance with Title 17 U.S.C. Section 107. 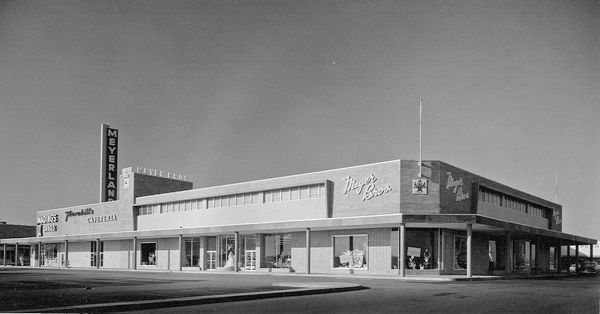 Meyerland Plaza, one of the Meyer Bros., Inc. stores, Houston. Image available on the Internet and included in accordance with Title 17 U.S.C. Section 107. MEYER, LEOPOLD LEOPOLD (1892–1982). Leopold Meyer, retail merchant and medical fund-raiser, was born in Galveston on June 21, 1892, the sixth of nine children of Achille and Malline (Kahn) Meyer. He was named for his grandfather and his godfather, both of whom were named Leopold. He received his B.A. degree from Tulane University in 1912 and returned to Galveston, where he followed his brothers into the retail business. He worked for F. S. Levy and Company in Houston until 1918, when he joined Foley Brothers Dry Goods Company; there he quickly worked his way up to executive vice president and credit manager. In 1946 he and his brothers opened a retail operation known as Meyer Brothers, Incorporated, which grew to ten stores by 1957. Leopold served as chairman of the board until he and his brothers sold the business to a national chain. 100 Club Logo. Image available on the Internet and included in accordance with Title 17 U.S.C. Section 107. In 1931 he married Adelena Levy Goldman; she had a son and a daughter from a previous marriage. The daughter's death at age fifteen in October 1939 spurred Meyer to devote his life to raising funds to build and maintain Texas Children's Hospital and other charitable medical organizations. He headed fund-raising campaigns that raised millions of dollars for the Texas Children's Hospital charity fund and was a founder of St. Luke's Episcopal Hospital in Houston. Meyer was founding chairman of the Muscular Dystrophy Telethon and was cited for outstanding contributions to the Houston Pediatric Society and the Texas Association for Retarded Children. In the early 1920s he was one of the founders of the old Community Chest (now the United Fund), and for many years he was chairman of the board of governors of the Harris County Center for the Retarded. He also helped start the Holly Hall Protestant Home for the Aged and actively supported the Houston 100 Club, which benefited the widows and children of Houston police officers killed in action. He served as a trustee of Baylor University and endowed a chair for developmental pediatrics at Baylor College of Medicine; the Leopold L. Meyer Center for Developmental Pediatrics at Baylor annually evaluates hundreds of children's disabilities. Leopold Meyer receiving a plaque as a donor of the Friends of the Library at the University of Houston, 1969. Courtesy of the University of Houston Libraries. Image available on the Internet and included in accordance with Title 17 U.S.C. Section 107. Photograph, Grave of Leopold Leopold Meyer in Houston. Image available on the Internet and included in accordance with Title 17 U.S.C. Section 107. In 1921 Meyer became president of the Houston chapter of the Retail Credit Merchant's Association, and in 1927 and 1929 he served as president of the National Retail Credit Association. During that tenure he worked with Secretary of Commerce Herbert Hoover to initiate annual nationwide credit surveys as a boon to retail trade and a service to consumers. For ten years he served on the advisory committee of the University of Texas Bureau of Business Research. He helped reorganize the Houston Retail Merchants Association in 1942 and served as its president until 1944. His success in business enabled him to pursue an impressive range of interests and to devote his major energies to raising money for the charitable causes that he loved. He helped found the Houston Amateur Baseball Federation and was its president. He was also chairman of the board of the Houston Civic Music Association and an officer of the Houston Symphony Society. In the early 1940s he organized the Friends of the Library at the University of Houston, where several scholarships have been established and awarded in his name. He served on the University of Houston Board of Governors from 1956 to 1961. For many years Meyer was director of the Houston Livestock Show and Rodeo, and for twenty-three years he headed the Houston Horse Show Association. His special project was the annual Pin Oak Charity Horse Show, the proceeds of which supported Texas Children's Hospital. In 1950 he was chairman of the fund drive for the United Jewish Appeal, and for three years he served as president of Congregation Beth Israel in Houston. The National Conference of Christians and Jews cited him for his philanthropic work in 1961, and in 1969 the National Jewish Hospital and Research Center named him Man of the Year. Proceeds from his locally published 1975 autobiography, The Days of My Years, are donated to charity. He died on November 1, 1982, and was buried in Beth Israel Cemetery, Houston. Natalie Ornish, Pioneer Jewish Texans (Dallas: Texas Heritage, 1989). Who's Who in World Jewry, 1965. Handbook of Texas Online, Natalie Ornish, "MEYER, LEOPOLD LEOPOLD," accessed April 18, 2019, http://www.tshaonline.org/handbook/online/articles/fme44.